Itsekiri National Development Initiative, INDI, a group of Itsekiri elite, has promised to support the new management of the Presidential Amnesty Programme under the leadership of Professor Charles Dokubo to recalibrate and reboot the programme to achieve its major mandate. The group, in a statement by Dennis Mene, Chairman and Henry Omajugho, Director of Contact and Mobilisation, said they were in full support of the eight-man special review committee to ascertain the present status of the programme and redirect the programme to meet present realities in the Niger Delta. The group urged the new management to speed-up plans to meet the demands of beneficiaries in schools and training centres especially Itsekiri beneficiaries that were recently deployed before the removal of Brigadier General Paul Boroh (retd). 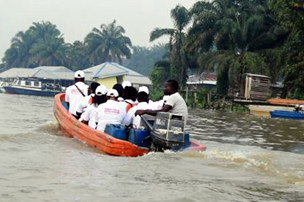 The group advised beneficiaries that are not yet deployed for education and vocational training categories to remain calm as they are confident in the new administration to ensure that the itsekiri nation benefits maximally in the programme. The post Itsekiri group pledges support to new mgt of amnesty programme appeared first on Vanguard News.